The vessel is Late Iron Age – Roman transition period (circa Mid-1st century AD). It is a fine example of a good quality locally produced narrow-mouthed domestic storage jar, wheel trimmed and clamp fired (not kiln fired). In situ complete vessels of this type are comparatively scarce. Discovered in a ditch alongside three similar, incomplete jars of the same date, this vessel would most likely have been deliberately buried as a votive*. 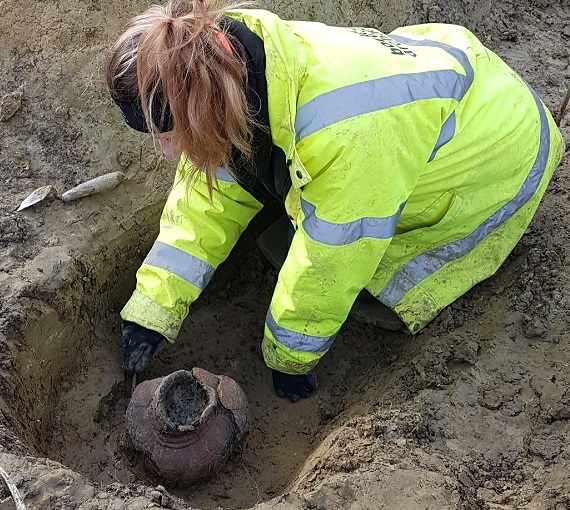 This provides an opportunity for our in-house Palaeoenvironmental Team to carry out further analysis by examining the contents of the jar to shed light on what was buried within all those years ago…. *A votive offering is one or more objects deposited or displayed, without the intention of recovery or use; usually placed for broadly religious purposes/beliefs.